The JSE got off to a cagey start as global markets struggled to find direction amid the trade war escalations. Concerns are rife that the USA will impose a further $200bn (about R2.97bn) in tariffs on Chinese goods this week after Donald Trump signalled his intent last week. China is expected to retaliate with similar tariffs should the USA proceed with imposing the tariffs. The sell-off in emerging market currencies has not helped their equity markets as investors are becoming more cautious given the recent events in Turkey. The rand slumped to a session low of R14.94 against the greenback as investors fled to a safety. The rand retraced to trade at R14.84/$ at 17:00. The local bourse swung between gains and losses before gaining some direction towards the close. Hospitality group, Sun International [JSE:SUI] jumped 7.1% to close at R56.09 per share after the company announced that an investigation into a shareholder dispute at its Nigerian operation was close to being concluded. The conclusion of the matter could result in the company exiting that market. Stadio Holdings [JSE:SDO] rose 6.38% to close at R4.67 per share following the release of its half-year results which indicated healthy increases in student numbers and profit margins. Sibanye Stillwater [JSE:SGL] recorded another session of gains to add 3.86% which saw the stock close at R8.88 per share. Listed property stock, NEPI Rockcastle [JSE:NRP] was one of the top gainers on the blue-chip index after the stock added 2.17% to close at R143.04 per share, while The Foschini Group [JSE:TFG] posted gains of 2.55% to close at R177.88 per share. Steinhoff International [JSE:SNH] slipped to R2.59 after the stock dropped 7.5%. EOH Holdings [JSE:EOH] was also weaker to close at R37.32 after shedding 6.7%, while Rhodes Food Group [JSE:RFG] lost 1.25% to close at R19.70 per share. *Naspers [JSE:NPN] continued to trade under pressure as its Hong Kong listed associate, Tencent Holdings lost 2.12% in Monday’s trading session. Naspers closed the day 1.86% weaker at R3220.02 per share. Sasol [JSE:SOL] pulled back to close at R569.62 after shedding 1.11% and Growthpoint Properties [JSE:GRT] closed 1.02% softer at R25.18 per share. 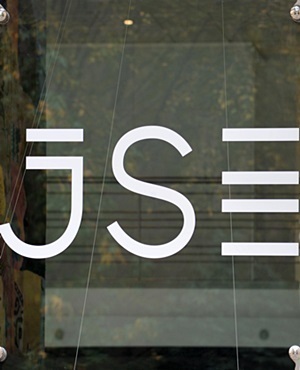 The JSE All-Share Index eventually closed flat, only managing to gain 0.07% while the JSE Top-40 index shed 0.05%. The industrials index retreated by 0.58%, however the financials and resources indices managed to firm by 0.49% and 1% respectively. At 17:00, gold fetched $1201.35/Oz, while platinum and palladium were flat to trade at $787.85/Oz and $982.37/Oz respectively. Brent crude gained over a percent to peak at a session high of $78.44/barrel before retracing to trade at $78.27/barrel just after the JSE close. Bitcoin traded mildly firmer to be recorded at $7280.00/coin at 17:00, while Ethereum was down 1.2% to trade at $289.00/coin.